I will show you what to do. How to do it. Which exercises will be most effective to reach your goals. I will keep you safe and show you proper form. I will push you. I will motivate you. I will tell you how much and how long you need to work out aerobically so you train smarter instead of harder. I will coach you on your diet and maintaining healthy eating habits. Most importantly, I will hold you accountable. I will be your support as you work towards a healthier lifestyle. I am experienced and dependable and I will get you to your goals - whether they may be improving athletic performance, taking off weight, or rehabbing after illness or injury. There is no shortcut to becoming fit and healthy. Exercise and proper nutrition are key. I don't believe in fad diets or trends. I incorporate nutritional counseling, weight training, body weight training, aerobic work, core work, and stretching. I motivate my clients by being tough yet supportive - and my clients get results. I am a group fitness instructor and Life Guard. I can help clients with a variety of programs: running, cycling, swimming...and often engage in these activities with my clients. I have a business degree. I currently hold ACE Personal Trainer, ACE Health Coach, and Group Fitness certifications, Aquatic Exercise Association certification, YogaFit, LeMond Cycling, and pre/post natal certifications. I am constantly taking continuing education to keep myself challenged and informed. I have been training and teaching fitness classes for over 14 years. I have worked for a several area gyms but now have my own personal training business. I love helping people change their lifestyles and their bodies! 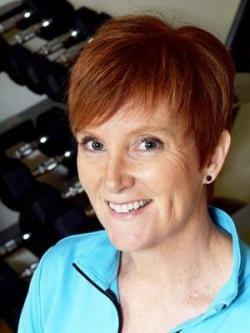 I have experience working with a wide variety of clients from athletes to those with special needs such as breast cancer survivors, morbidly obese clients, knee replacement, post cardiac, Type I and II diabetes, and pre and post-natal clients.